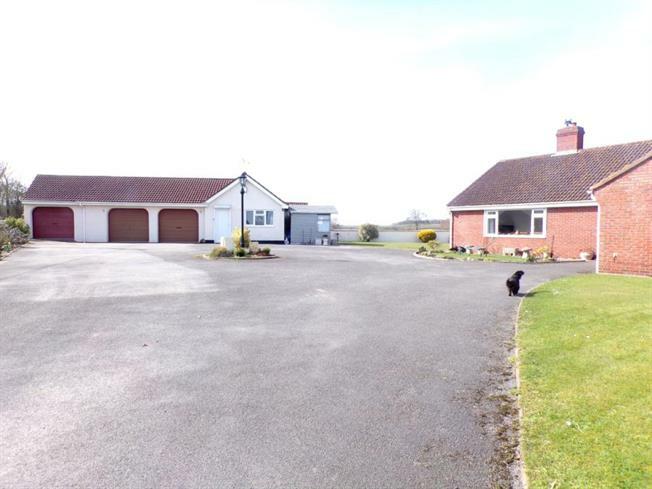 4 Bedroom Detached Bungalow For Sale in Bridgwater for £475,000. A rare opportunity to acquire a large, detached bungalow with a detached complex comprising triple garage, games room and three double bedrooms. Bona Vista comprises a large entrance hall giving access into the living room which stretches over 22ft and boasts a wood burning stove and sliding doors out into the garden and has beautiful views across open fields. The master bedroom is a generous size with en-suite shower room. Two further double bedrooms are also accessed from the hall, both of which enjoy fantastic views. The family bathroom is modern and spacious and benefits from a four piece suite. The dining room is 19'9 ft with sliding doors to the garden and an archway through to the kitchen. Adjoining is a utility room which leads into a rear porch/boot room. Externally, there is a large drive providing ample parking for numerous vehicles and well-proportioned lawned gardens with decked area, patio and fish pond to the rear. There also is a large summerhouse with power and lighting. The triple garages have electric doors and also have a separate oil fired boiler which, if necessary, could be converted into additional accommodation (subject to relevant consents). Bona Vista is situated on Knighton Lane, a no through road, close to the hamlet of Burton and the larger villages of Shurton and Stogursey. The property lies approximately 9 miles to the north-west of Bridgwater close to the north Somerset coastline and the nearby village of Stogursey offers a good range of village amenities including primary school, post office and stores etc. The property is a short drive from the Quantock Hills designated an area of Outstanding Natural Beauty within which many rural pursuits can be enjoyed. As well as being easily accessible to Bridgwater, Bona Vista is within a half hours drive of the County Town of Taunton. Bridgwater offers excellent road links via the M5 motorway junctions 23 & 24and the A38. With the town itself offering a good range of day to day amenities including secondary schooling. Taunton is a large commercial centre offering a more comprehensive range of retail, scholastic and leisure facilities.